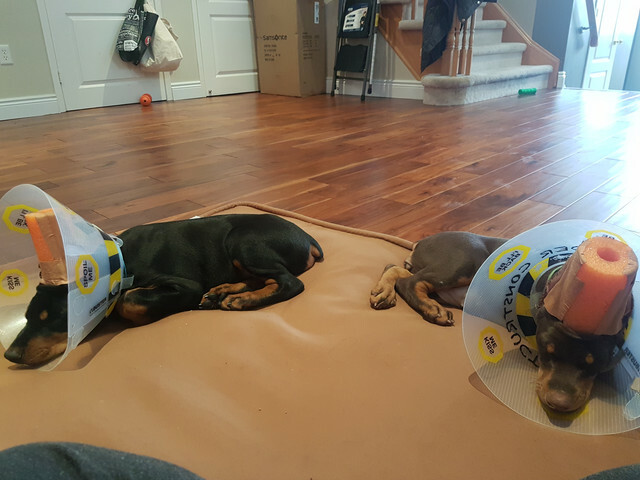 Doberman Forum : Doberman Breed Dog Forums > Doberman Specific Chat > Puppy Corner > He's here!! Welcome our new baby boy!! Ken had a question ! It pertains to feeding raw foods - just curious - But do you have worry about getting sick from feeding raw food ? From the bacteria on food bowls - or from where you prepare it at ? Do you have to super clean there food bowls ? I personally have never been worried nor has anyone gotten sick from feeding raw at my house. I'm the actual feeder so I've got it down to a science. I liken it to the same safe handling of raw meat that you would be cooking for yourself. No one is allowed to play with their food or carry it around the house. The bowls are kept on a mat in the kitchen and washed regularly. I only use human grade raw. At my store people buy some of the meats and organs to cook for themselves. I have a freezer in my garage that I store the raw food in but also keep some of our own food in there too. I have a drawer in the fridge that is for the dog food as I thaw my raw and don't feed completely frozen. Coco didn't like completely frozen food and I don't want Sugar eating it either because hes a baby and I want to make sure he's a good chewer and doesn't gulp and swallow his food. I am supervising his eating for now because he's a baby. With Coco I was in the kitchen with her but knew she was an excellent chewer so didn't need to be on top of her. It seems daunting and gross when you don't feed raw or when you start but it's really as easy as kibble once you have the hang of it. Coco was raw fed for 9 years of her life. I tried kibble the first year and it didn't agree with her at all. I always said if/when I got another puppy I was feeding raw from the start. I lucked out that the breeder also feeds raw and weaned the pups into it so he is a great eater already. For now hes on ground Turkey with bone, offal and tripe. I've got lots of goodies in the freezer to introduce him to in the future that is left over from Coco. FYI for Raw Feeders- Pet Partners (Spock's registration) therapy dog requirements don't allow evaluation or registration of any pet on a raw protein diet within last 4 weeks prior. Besides raw meats, this includes pig ears, raw bones and eggs due to risk of transfer of diseases to clients. injured or killed another companion animal. present a risk that the Therapy Animal Program simply can’t afford to take." Last edited by spocksdad; 03-04-2019 at 01:03 PM. Good thing that Sugar will not be a therapy dog because I would not change my feeding choice. I read and respect their blurb on raw feeding but the irony is that most mainstream vet clinics disagree with raw feeding for various reasons. The clinic I go to subscribes to this notion but luckily the particular vet Coco had and Sugar will be seeing today, sees the benefit of raw feeding. There are pros and cons of both raw feeding and kibble. As well as multiple studies for and against either method. We just have to feed what seems to be best for our lovies. Congrats on your little guy! He is such a cutie, I could kiss that face ALL day long, and what a perfect name you picked! I can't wait to see more pix of him growing up - and they do that so fast! Exciting, tiring, and fun times coming to your home! Thanks so much!! I have been kissing that face a lot and he likes to climb into my lap to cuddle. That won't last too long. He had a wellness check today and he's already 16 lbs!! Good thing Coco was a big gal so I am used to a biggie. He is helping us heal our heart after losing the old lovey because she left a big hole. I hope you and your lovies are doing well. Are we still sleep deprived?? NOX and Coco Loco like this. I am back to work today so I usually get up at 530 but Sugar made sure I was up at 5 lol. It worked out because I came to work early and sifted through all my emails. He was a little better last night but I hope we keep seeing some improvements. My husband is back to work today also so he will be home from 3 to 6 all by himself in his crate. I'm sure he will be very happy when I'm home!! Don't want to change subject here, but have to say, Nox, that is a beautiful head shot and gorgeous collar. I have an obsession about collars, too. Can you tell me where you got it? That collar is from Crazy Rebels, they are currently closed to new orders. You have to get on a waitlist and once you are up, it can take up to 6 months. They do have a lot of ready made sales, look them up on IG and FB. 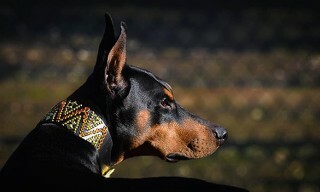 I have crazy rebels on Instagram and LOVE their collars.. haven’t bought one yet but they look well made and popular! And they do post often their ready made sales! Bummer their wait list is so long! And yesss love that collar!! Coco Loco and LadyDi like this. Congratulations on your newest family member, he is darling. Love those big paws! I'm so sorry for your losses. These lovies really leave a hole in your heart when they are gone. We had to let Coco go on December 21 and it has been harder than I had imagined. I was looking for a puppy in the summer but things worked out sooner and now Sugar is home with us. 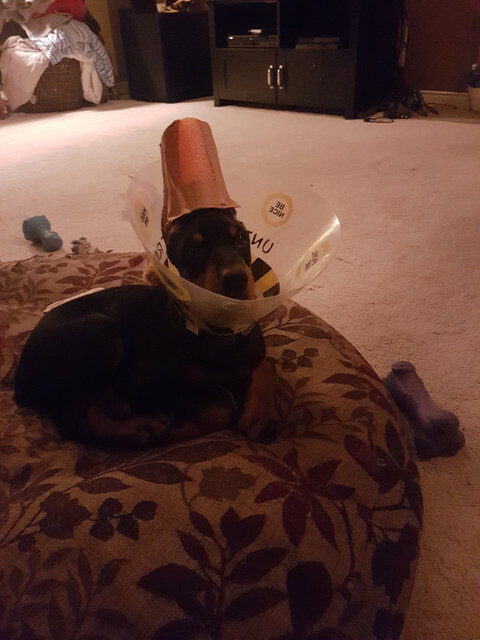 For a woman who never wanted a dog let alone a dobe, I couldn't live without one now!! Fingers crossed. Last night it only took Sugar 3 minutes to settle before he fell asleep. 2 pee breaks last night and up at 5am again. I'm getting to work a little earlier every morning because of my new alarm clock. Let's hope for a good settling into bed tonight!! Yay, Sugar! Learning the rules of the crate and how to settle on your own, a first step out of many. It's a good start. And remember, mommies are always more patient and understanding if they get enough sleep. All this conversation is kind of interesting but....Need.......MORE PHOTOS OF SUGAR!! I hear you triciakoontz!! I forgot how hard it is to take pics of a whirling dervish puppy!! 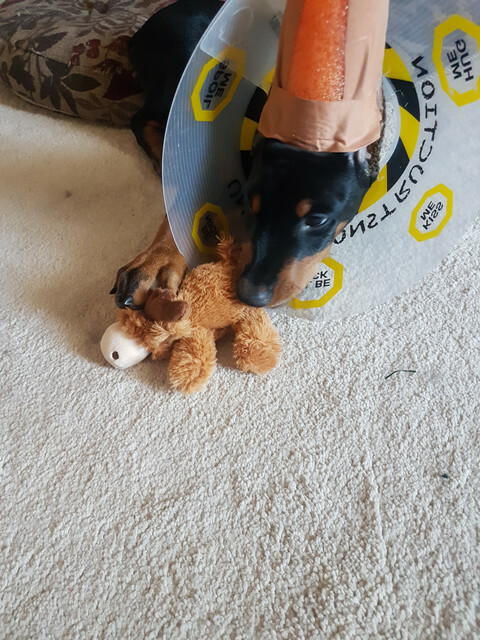 Sugar loves this moose toy he got from his aunt and uncle. He looks so small right now on Cocos bed. 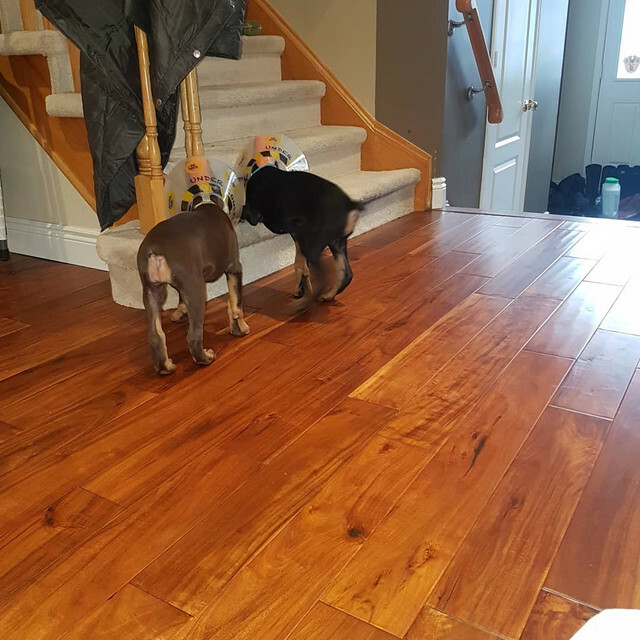 Sugars sister, Ginger, came for a visit and they had fun running around, biting each other and taking a nap!! Congrats on the little one! So cute!!! My puppy fever has been spiking again but hopefully this summer, there will be a new member for my little family! Well isn’t he just delicious!! So cool you are that close to have sibling play dates! He’s just ADORABLE! !